Chesapeake Energy Gets No Respect! Stock Should BE Trading In The $4s On Land Offer. Chesapeake Enrgy has property in LA up for Sale. CHK in talks to sell $2B plus of land with Tellurian. Stock is ready for short squeeze. Yesterday it was announced that Tellurian was in talks with Chesapeake Energy (NYSE:CHK) to purchase up to $2B of property located in Louisiana. Here is a clip from Schwab. 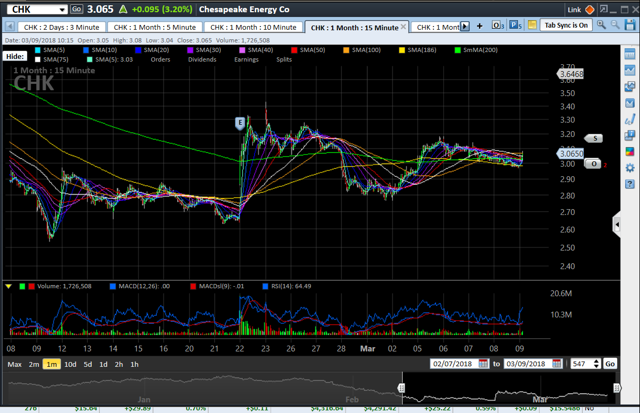 I know it seems like I am a perma bull on CHK. I am at this point. After the last earnings report, I believe the stage is set for a rally back to the $5 level in short order. Here is a chart that in my view shows right now as a great entry point. I am adding to position at $3 and feel like the days are numbered when you can buy this under $3.50. The stock has pulled back over 10% from the previous rally level on the earnings beat. In my view $3 is a total joke and way undervalued. This stock should be trading over $4 right NOW! Any large players out there could squeeze shorts right now at teh $ level for option expiration. How about we take this over $3.50 today? IT is my belief at some point in the very near future they will announce a sale that will take the stock back to the $5 level. Enjoy the weekend and look for this to rocket higher in the coming weeks. Stay off margin people! You know who you are. Disclosure: I am/we are long CHK.